Nebraska’s state policy allows students to earn dual credit for postsecondary courses taken at their high school or a postsecondary institution. There is no policy in place for students to earn dual credit in CTE. Public postsecondary institutions in the state are not required to accept dual-enrollment credits (ECS, 2015). The Gateway to College at Metropolitan Community College has partnered with an institution of higher education to provide one Early College High School program as part of the Early College High School Initiative (ECHSI). More information about schools participating in ECHSI is available at the ECHSI website (Jobs for the Future, n.d.). Nebraska has adopted the National Career Clusters Framework and rearranged the 16 Career Clusters into six "career fields." 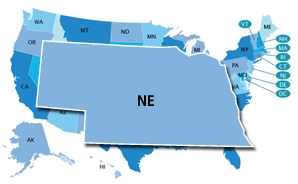 In addition, Nebraska is currently working on implementing programs of study within all 16 Career Cluster areas. In Nebraska, a Personal Learning Plan is a student's current plan of coursework and extended learning activities to meet the student's education, career, and life goals. Nebraska's Personal Learning Plan is in use but is not mandated by the state. It includes all students in Grade 7– postsecondary. These requirements are in effect beginning with students graduating in 2015. Nebraska may have a state-specific Early Warning System, but the system is not publicly available.